Two months ago I wrote about how Council approved our 2016 Operating Budget. Since the Province issued the property tax rate for Educational purposes last week, I can now provide you with an update on the total 2016 residential property tax bill. One independent way to judge whether Pelham’s taxes are “affordable” or not, is to compare them with inflation. For example, the Bank of Canada calculates that, over the last 10 years, inflation increased the value of goods and services by 17.7%. 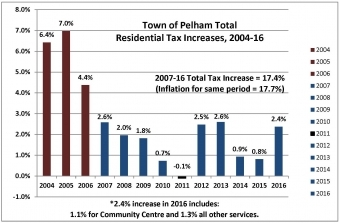 Over the same period, Pelham’s combined taxes for the average residential property in Pelham increased by 17.4% -- slightly less than inflation. And, this includes the amount already included in the Town’s 2016 budget to help fund the Pelham Community Centre.